Hot wings. 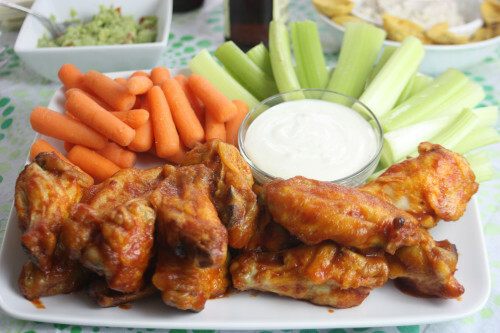 The quintessential Super Bowl party food and often a favorite snack of the college crowds. Despite their popularity, I have shied away from making them for parties since I didn’t want to slave over a vat of oil. After some kitchen tinkering, my hot wing-free party spreads are now a thing of the past. I recently tried baking them to achieve the crispy golden crust and I was pleasantly surprised that they fit-the-bill without the mess of deep frying. The first thing to remember when preparing hot wings is to use wingettes and drumettes, not the entire wing ( I have my mother-in-law to thank for that tip!). Wingettes and drumettes can be purchased pre-packaged, or you can buy whole wings and separate them into the tip, wingette, and drumette (discarding the tip section). After an hour of baking, my wingettes and drumettes were ready to be slathered in a hot sauce. A mixture of sriracha sauce, chili sauce, and butter created a spicy coating with what I would consider medium level heat. 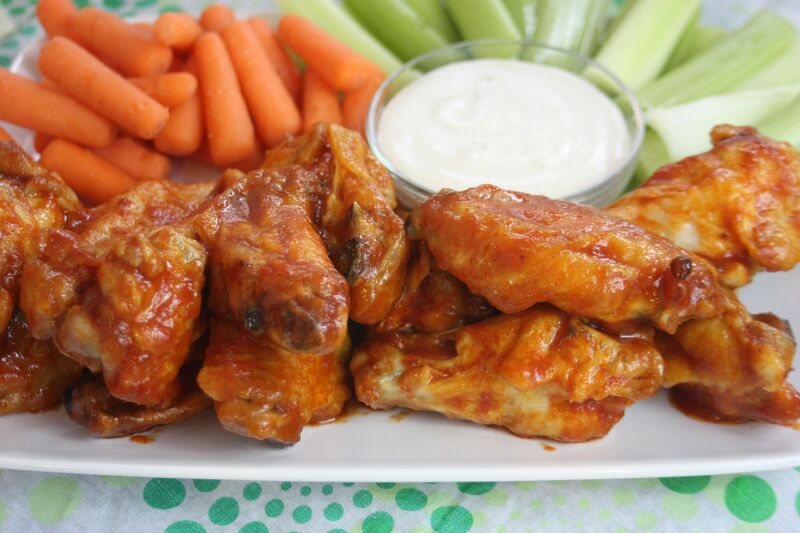 Once the wingettes and drumettes are coated, the sriracha hot wings are ready to serve with whichever dipping sauce you prefer – ranch or blue cheese. 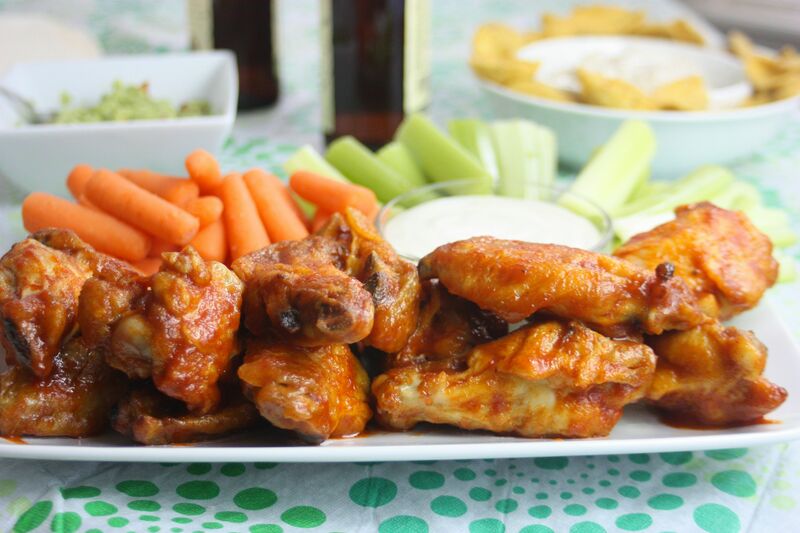 Even surrounded by a variety of dips and other snacks, these sriracha hot wings stand out as a sure crowd-pleaser. Place a wire rack on a baking tray and spray with non-stick spray. 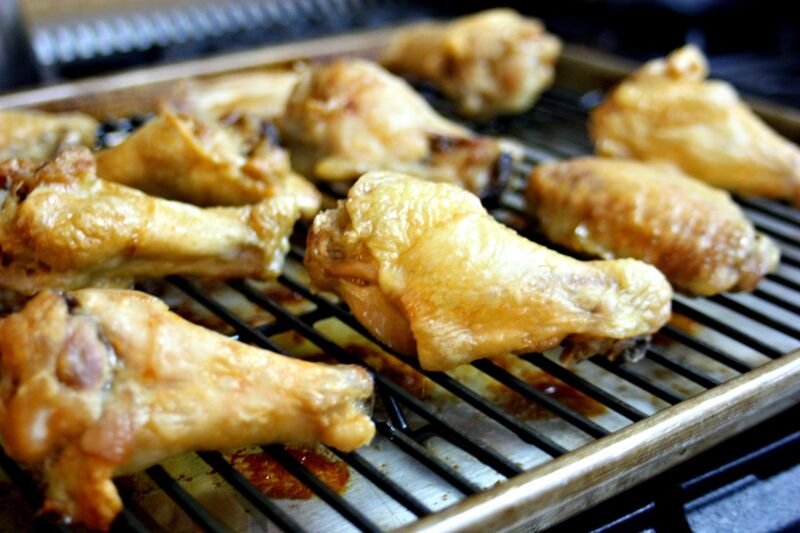 Place chicken on the rack and bake for 50-60 minutes, or until golden brown. Just before the chicken is done, stir together the butter, sriracha, and chili sauce in a large bowl. Add the cooked chicken wingettes to the bowl and toss to coat. Serve with ranch or blue cheese dressing.